Sunday, July 16: Today I am finally meeting my Japanese friend Yukie from Instagram! We’ve followed each other for a number of years, but I think it must have been when I posted pictures of my trip to Portugal in 2013 that she found me, or I found her. Ever since I arrived in Japan, she’s been direct messaging me on Instagram to check in with me, to see what my plans are each weekend, to find out what I think of the places I visit, to suggest places I should see, to tell me things about herself. Her messages to me have been helpful, super friendly and caring. They have made me feel like I belong, that I have a friend here, that I’m not alone in this sprawling and unfamiliar world. Yukie goes by the name of @mondechiara on Instagram. I highly recommend you check out her photos. She’s an enthusiastic lover of art and travel, and she holds a special place in her heart for Portugal. On her Instagram page, she posts pictures of Portuguese laundry (which she adores! ), Lisbon streetcars, building facades and azulejos, rooftops and balconies, street art and coastlines. She also posts pictures of her cats, as well as pictures of Kamakura (with plenty of hydrangeas) and the greater Tokyo area. She has a 14-year-old son and a 12-year-old daughter and works full-time in Tokyo. Though she works hard, she always finds time to attend her children’s extracurricular events, to go out to tea or dinner with friends, to visit art galleries, or to go on photo outings. She suggested we meet in Shinjuku to visit the Yoshida Hiroshi exhibit at the Seji Togo Memorial Sompo Japan Nipponka Museum of Art. She had recommended the exhibit to me some time back. When I sent her a list of all the things I wanted to see in Tokyo before I left, she chose the exhibit (which I’d included on my list) as the place she’d like us to visit together. I meet her at 10:00 at the Shinjuku Station West Ground Gate. She normally doesn’t post pictures of herself on Instagram, so I’m not sure how I’ll find her, but we somehow recognize each other by the looks of anticipation on our faces! We walk to the museum and join the queue to get in; of course, as is the case with most Japanese museums, no photography is allowed. I’m disappointed about this because the exhibit is fabulous. At least, we are able to take pictures of Shinjuku from the 42nd floor museum windows. 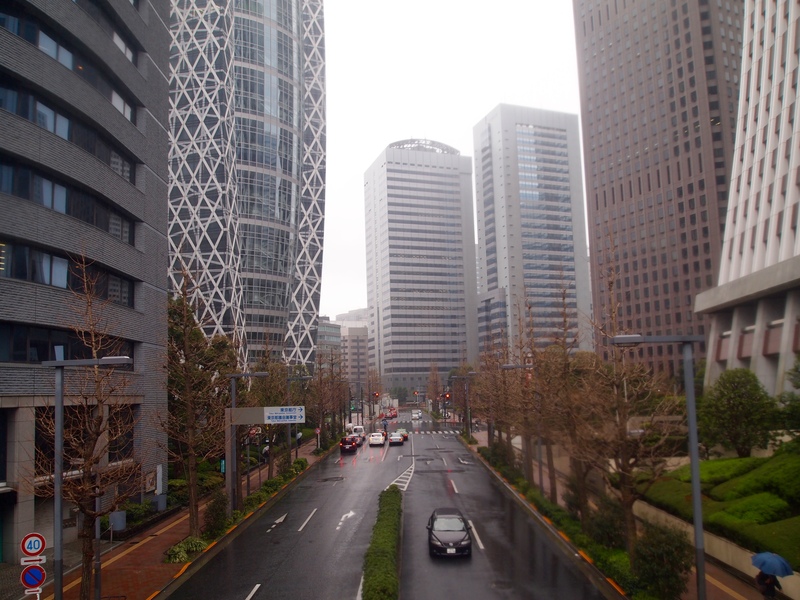 Out the window of the museum, we also get a view of the Rainbow Bridge, Roppongi Hills, Mode Gakuen Cocoon Tower, and Shinjuku Station. Hiroshi Yoshida (1876-1950) was a leading landscape painter during the Meiji and Showa eras. Born in Kurume, Fukoka Prefecture, he studied Western-style painting at a private school in Tokyo. This expansive retrospective exhibition commemorates the artist’s life and work, featuring over 200 carefully-selected watercolors, oil paintings, and woodblock prints ranging from early in his career until his later years. Hiroshi Yoshida’s uncompromising attitude led his colleagues to dub him the “demon of painting.” He traveled to the United States in 1899 where he held several exhibitions and won acclaim for his watercolor painting technique and the high quality of his work. He later traveled around Europe and the United States, where he presented oil paintings and woodblock prints of various landscapes around the world and Japan, according to the museum’s website. Since we can’t take pictures, I buy a couple of postcards of the artist’s woodblock prints, which I’ve photographed below. The first one, of the wisteria over Kameido Bridge, is a great keepsake, as I visited Kameido Tenjin Shrine on May 7: the wisteria festival at kameido tenjin. The main difference is that the drum bridge is not red in the woodblock print. The bridges are now painted a cheerful red color, but they must not have been painted so in 1927. Yoshida painted a myriad of landscapes capturing natural beauty and is known for being particularly fond of capturing mountain peaks in his works; he even made a point of climbing the Japanese Alps every year. There is a rich expressiveness present throughout his works, underpinned by his careful attention to nature and assured technique, which has captivated people both in Japan and around the world. The artist has left an indelible impression on the history of contemporary Japanese painting, according to the exhibit write-up. 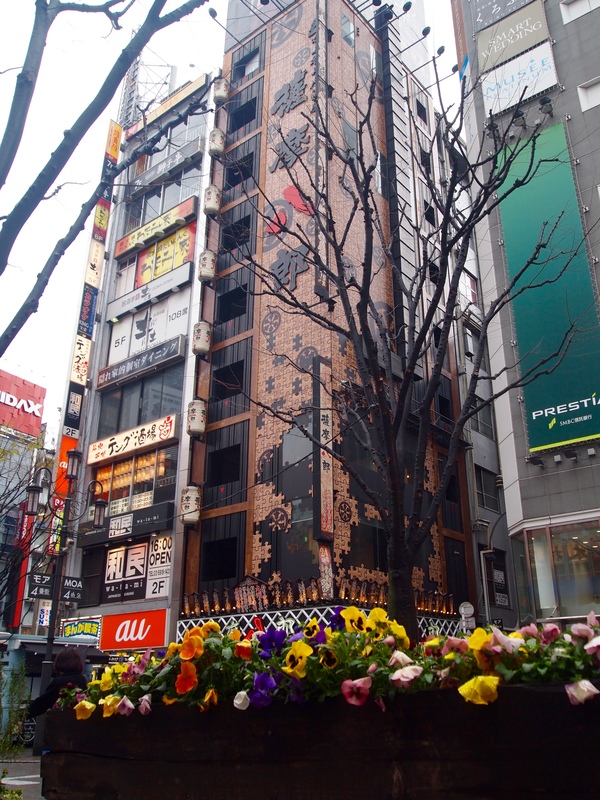 Two hours after meeting and visiting the museum, we take a walk through Shinjuku Omoide Yokocho, a shopping area near Shinjuku’s West Gate that rose up after World War II’s devastation. Before the war, stalls sold clothes, shoes, and personal products such as soaps. 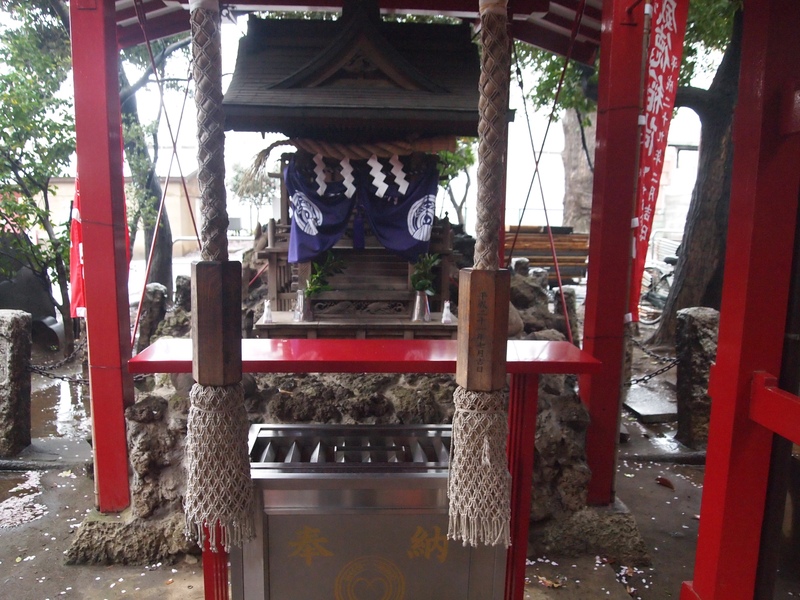 In addition, 30 to 40 booths sheltered with reed screens sold oden (various foods cooked in Japanese style broth), boiled potatoes, boiled red beans, tempura, tsukudani (seaweed boiled in soy sauce), and used books, but all were destroyed by fire. After the disaster, “Lucky Street,” a black market consisting of stalls divided by boards, appeared. People who had suffered the upheaval of war gathered in Shinjuku, and started to run their own businesses (Shinjuku Omoide Yokocho: History). Did I mention that, once again, it is sweltering hot here in Tokyo on this July day? 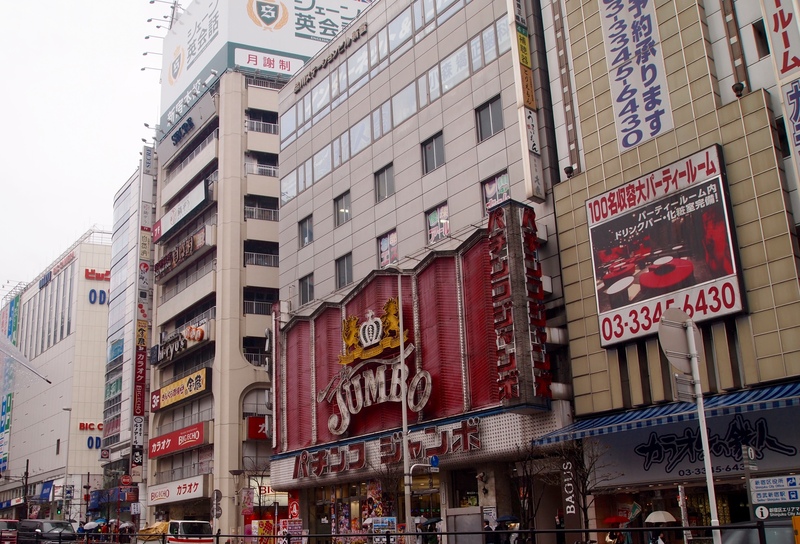 I told Yukie I was going to explore the area around Kabukicho after our visit to the museum, and that of course I’d love to have her come along, but that she shouldn’t feel obligated. I’m happy she decides to come along. When we arranged our meeting, she told me she wanted to take me to an okonomiyaki restaurant. I have been hesitant to try okonomiyaki because it is often made with squid; as I hate squid I haven’t trusted my ability to order it without that tough chewy creature. 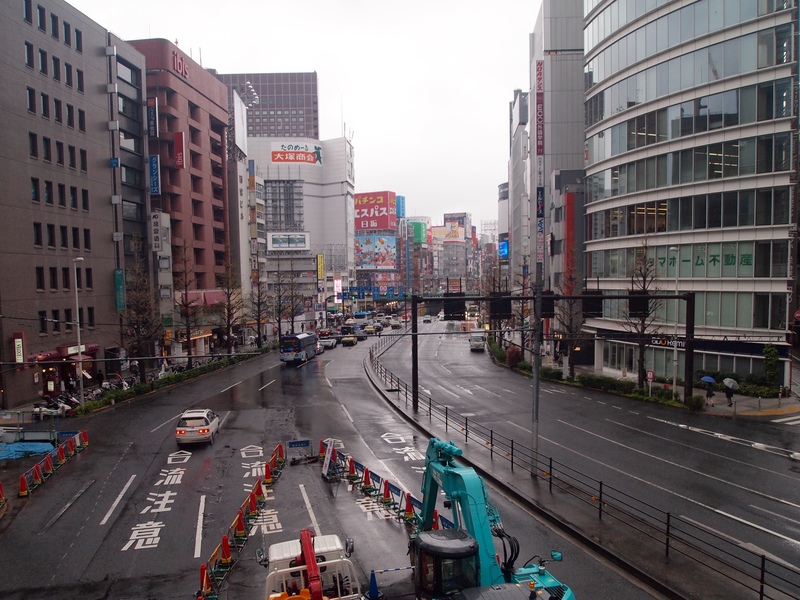 Now, as we head toward Kabukicho and the restaurant, I’m looking forward to finally trying the famous savory pancakes. 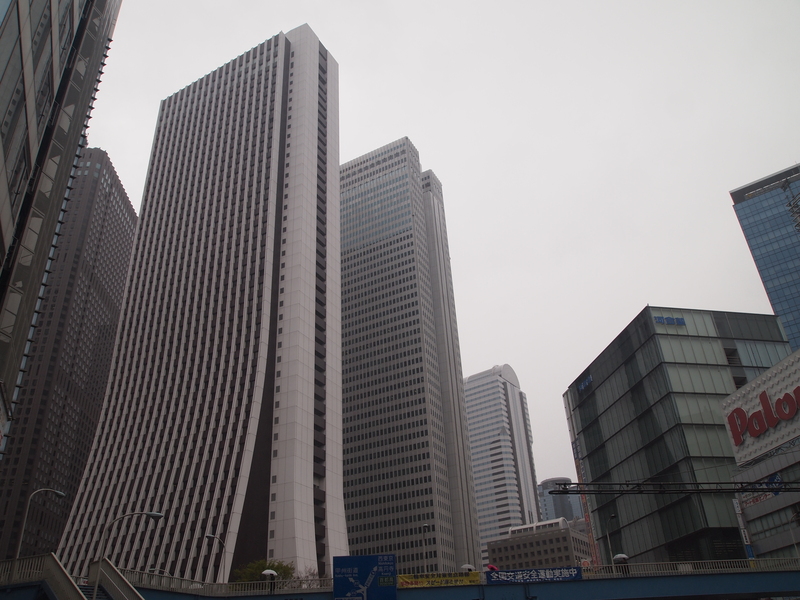 Sunday, April 9: After leaving Shinjuku Gyoen and taking the metro back to Shinjuku Station, I walk out the west side of the station to see the Skyscraper District. 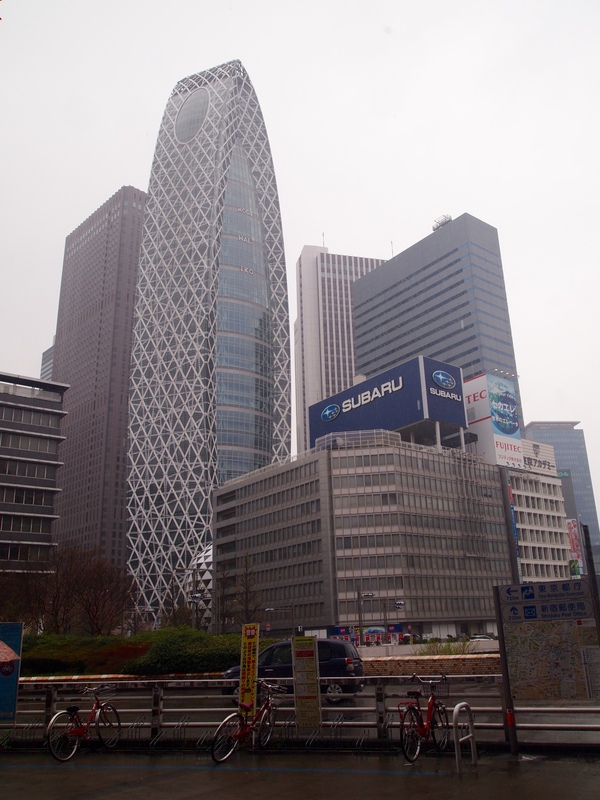 Shinjuku is the world’s busiest train station, handling over 3.6 million passengers a day. With over 200 exits and numerous platforms spread out over a large area, it serves as an essential transit hub for the Tokyo rail and subway network as well as rail links throughout the greater Kanto region. 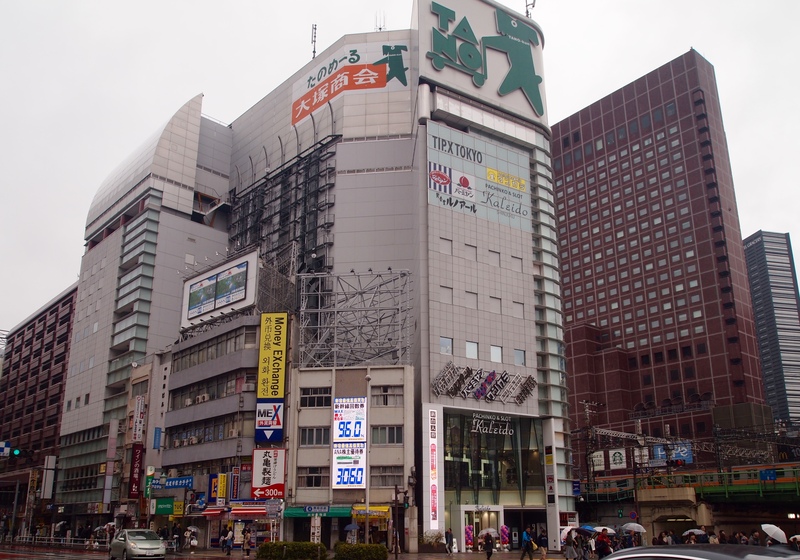 Department stores cover nearly all sides, according to the Shinjuku Station website. I’m so confused, I’m not really sure where to exit, but I just see a random west exit and emerge from the depths. This is my view when I first exit. Below is one exit, but not the one from which I came. It’s still raining like the devil. It’s such a drab day, I have to stop to take a picture of a colorful florist. One of my colleagues had on a cute outfit at work the other day and she said she bought it at Uni Qlo. 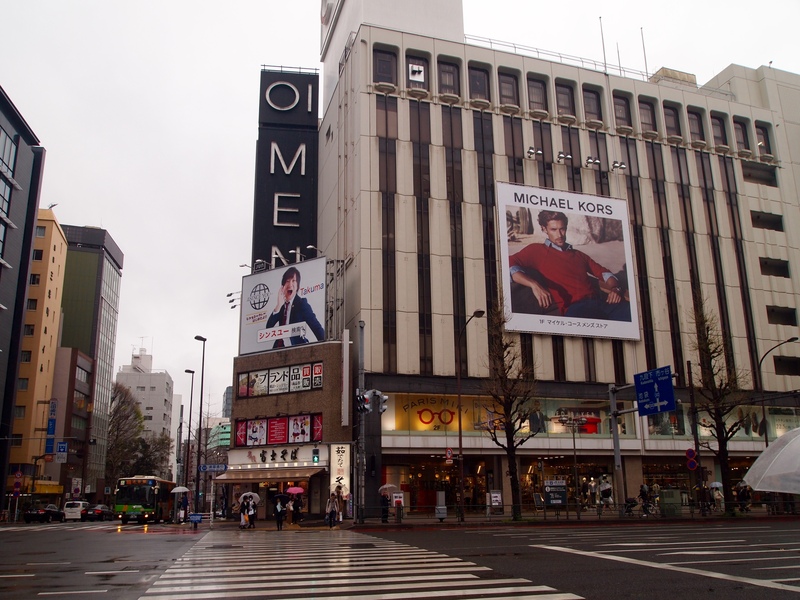 I find one here in Shinjuku, so of course I have to go in to explore. Sadly, I come out empty-handed. I have a hard time getting oriented. There are roads going out into all directions and walkways over the roads. I wander around and it’s raining so hard, I can’t even get my map out to find my bearings. I wander around randomly for a while until I find someplace to eat. 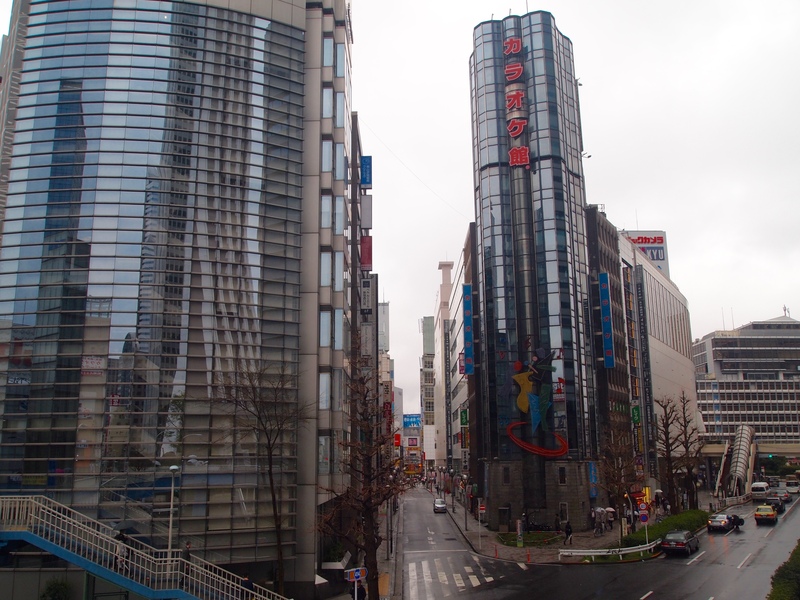 There are several restaurants around the area, including one conveyor belt sushi restaurant that is packed with people. I decide on 3rd Burger. I’m not too happy with my lunch, as the hamburger “with vegetables” is rather chewy. However, it is a pleasant place to find relief from the rain and to study my map, rather than continue to wander around haphazardly. 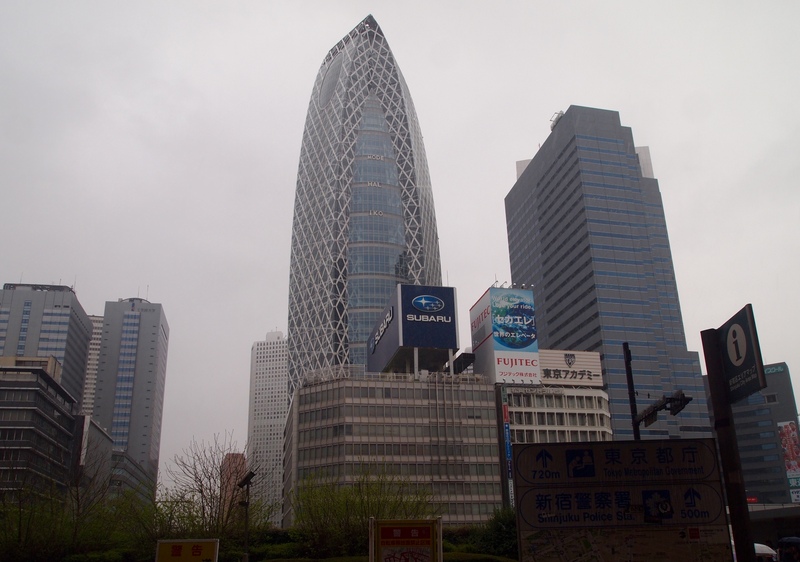 The most noteworthy skyscraper I see first is the Sompo Japan Nipponkoa Head Office Building, corporate headquarters for Sompo Japan Insurance. 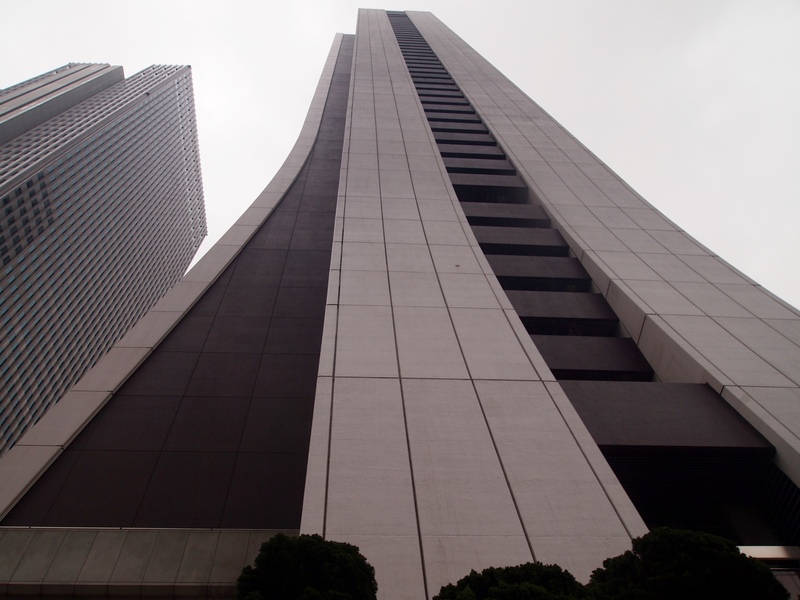 At 200 metres (656 ft), the building is the 28th tallest building in Tokyo and the 33rd tallest in Japan. 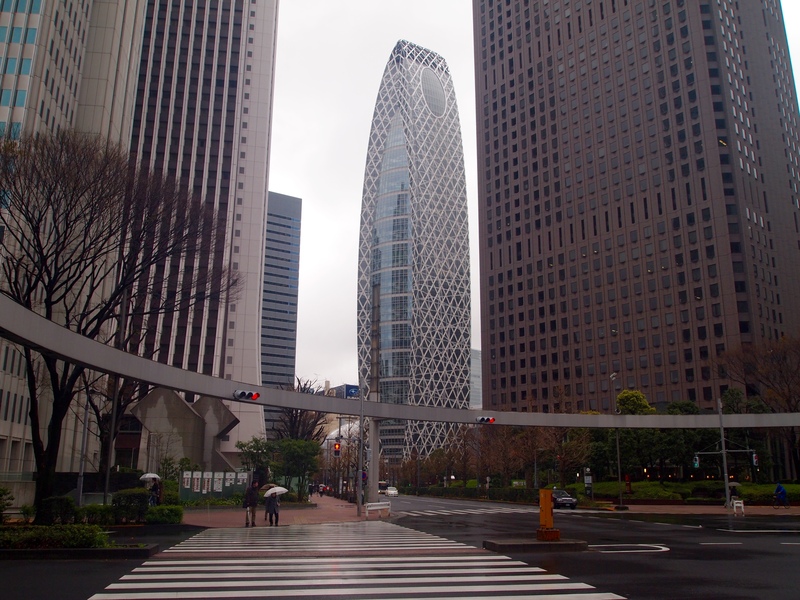 Inside this building is the Seiji Togo Memorial Sompo Japan Nipponkoa Museum of Art. It’s named for the Japanese artist who is known for his paintings of young women. It sounds appealing, and I try to go in but sadly find it is closed today. It would have been a great way to stay dry for an hour or two. 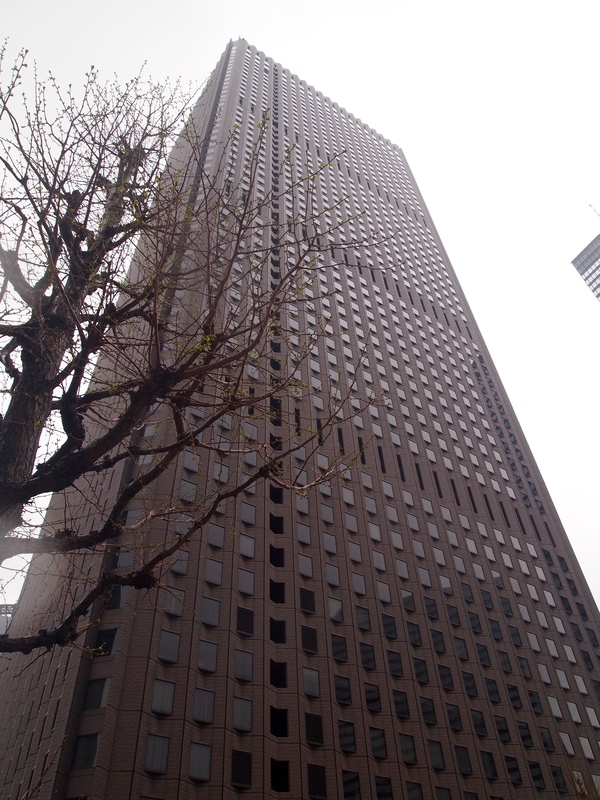 The 54-story Shinjuku Center Building has a free observation deck on its 53rd floor, but I don’t bother going up since I won’t be able to see anything anyway. 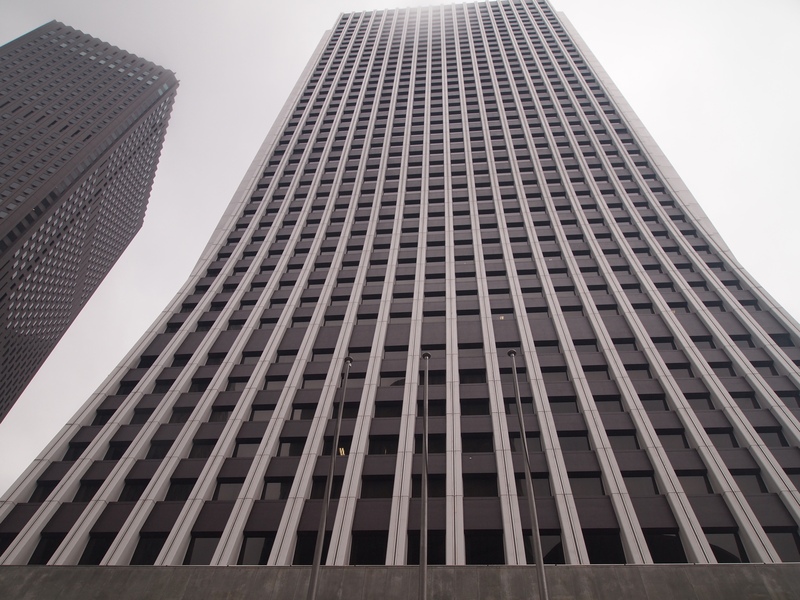 It serves as the headquarters of the Taisei Corporation and is the workplace for 10,000 people, with 25,000 visitors. It was featured in the 1984 film, The Return of Godzilla. 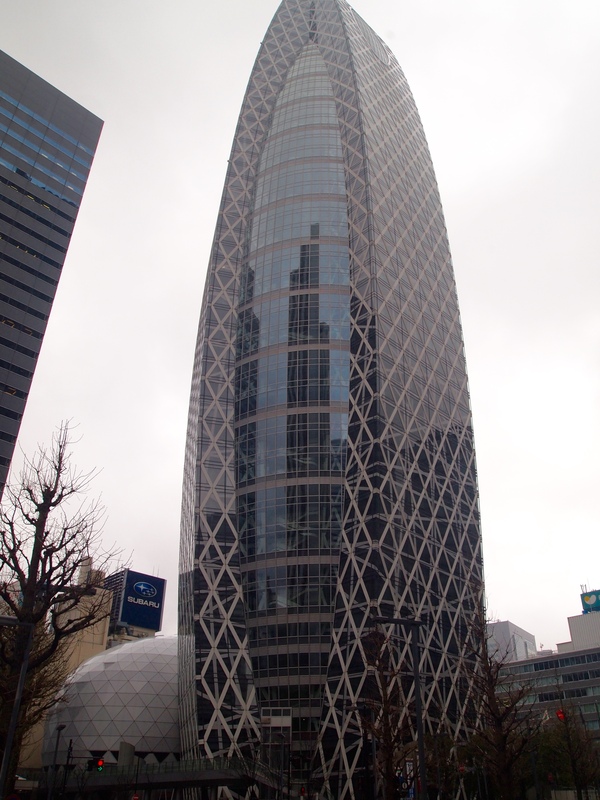 The most fabulous building in my eyes is the 50-story, 204-meter (669 feet), Mode Gakuen Cocoon Tower. 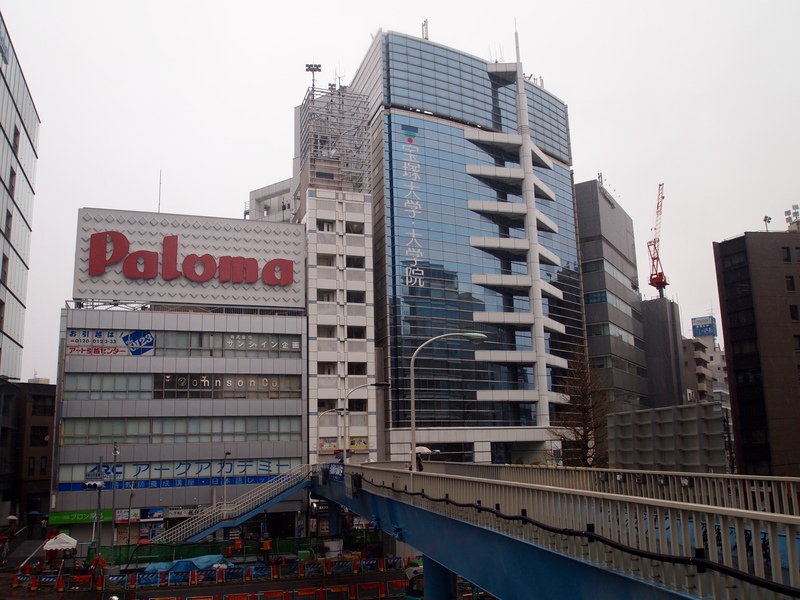 The building is home to three educational institutions: Tokyo Mode Gakuen (fashion vocational school), HAL Tokyo (special technology and design college), and Shuto Ikō (medical college). 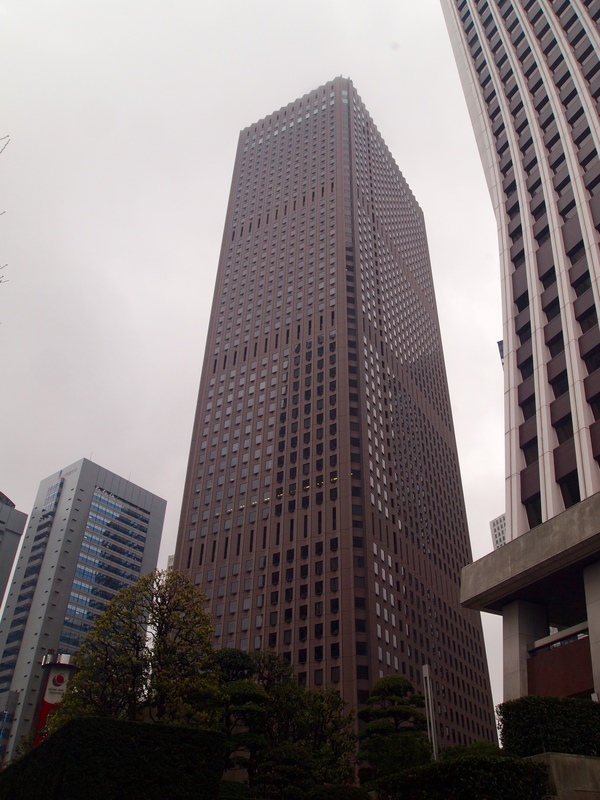 Completed in October 2008, the tower is the second-tallest educational building in the world and is the 17th-tallest building in Tokyo. 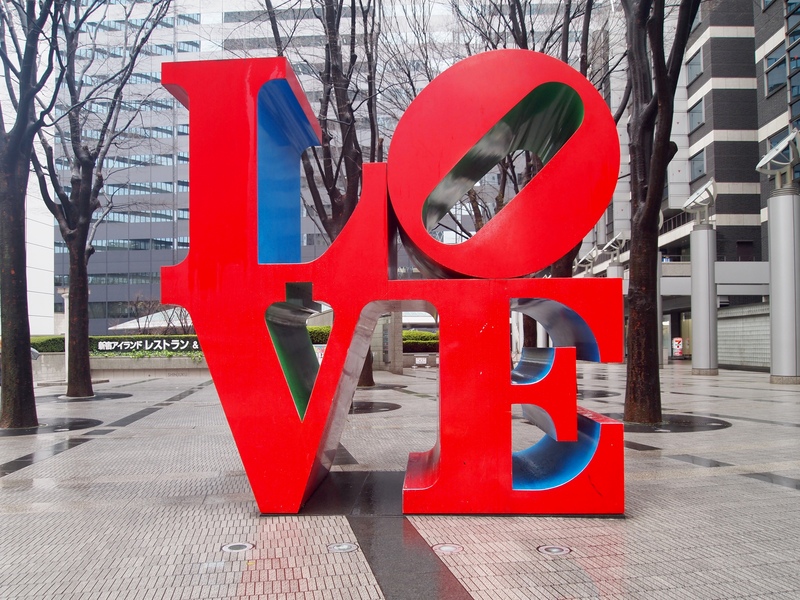 I’m surprised to find the LOVE sculpture that originates in Philadelphia. While walking around in Shinjuku, a gust of wind catches my umbrella and turns it inside out, breaking one of the ribs. One of the metal pieces is sticking out dangerously, and I can’t help but think it might poke my eye out. 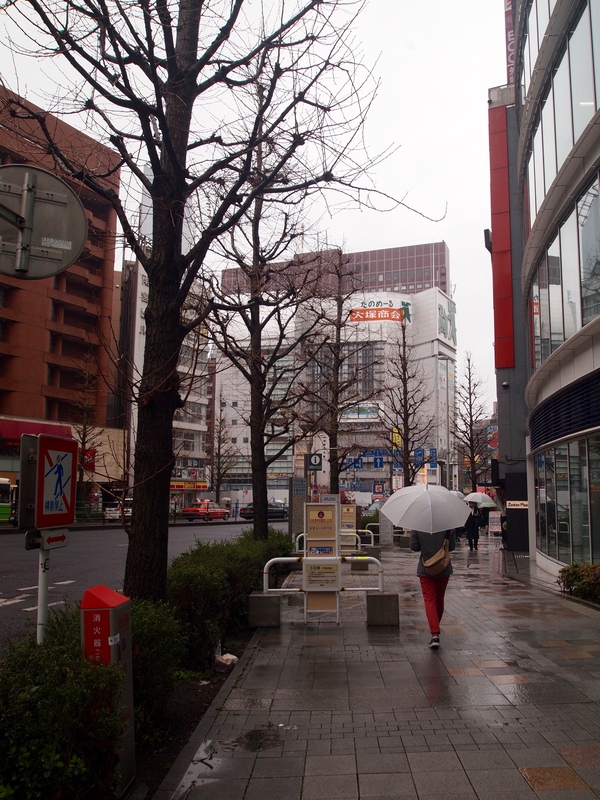 As I head to the Family Mart to buy a new one, it stops raining. I put my umbrella in the umbrella stand and go inside the Family Mart to check out what’s available. 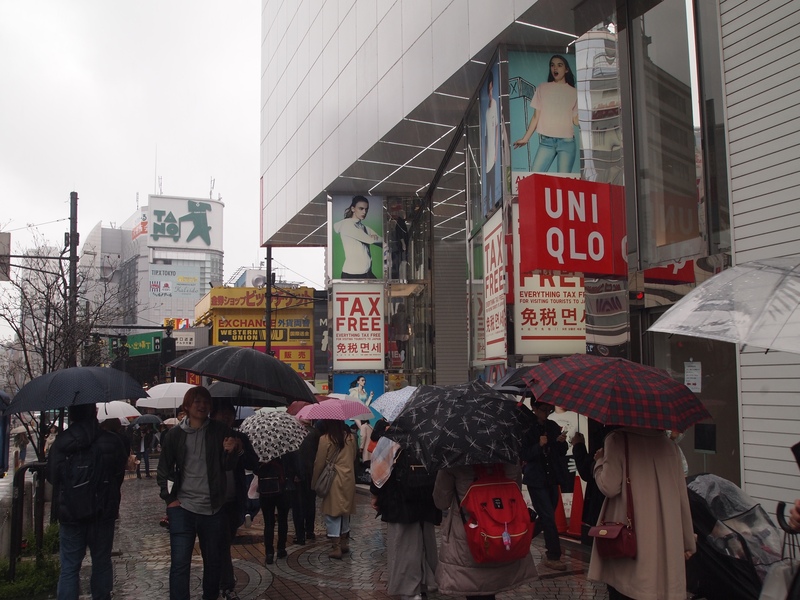 Since I already spent an outrageous sum of 2,800 yen (~$26) to buy my umbrella at Tokyu Hands, I’m not keen to spend another 1,280 (~$12) today if I no longer need to. I only brought a certain amount of money to hold me until pay-day on April 26, and I need to make my money last. I forego the new umbrella and leave my broken one in the rack. I would have just trashed it, but as Tokyo has such strict rules about what you can put in the trash, I wasn’t sure of how to dispose of it. 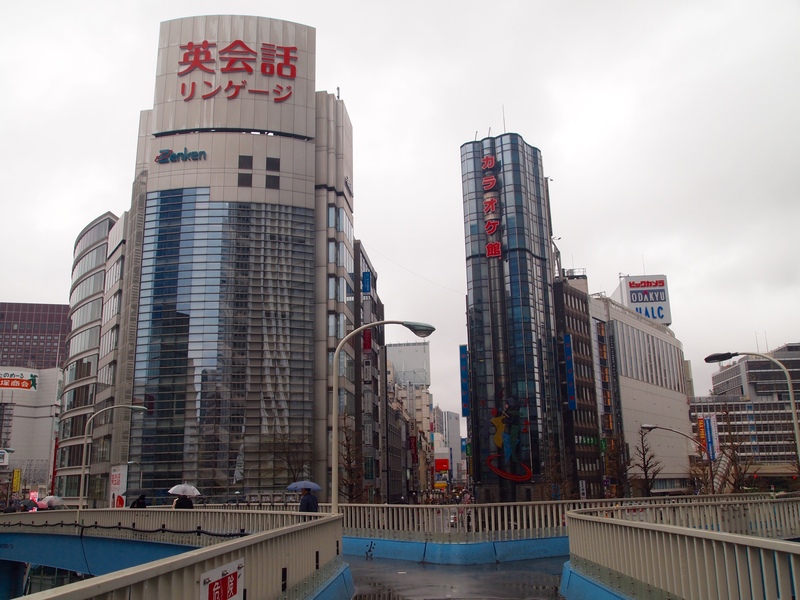 I return to Shinjuku Station to walk over to the east side of the station. As soon as I exit the station on the east side, two nice Japanese ladies standing near an information area ask me where I’m going. I tell them I’m in search of Hanazono Shrine. They kindly direct me, and as I make my way there, it starts to rain again. It’s a light drizzle at first, so I think I might be okay. 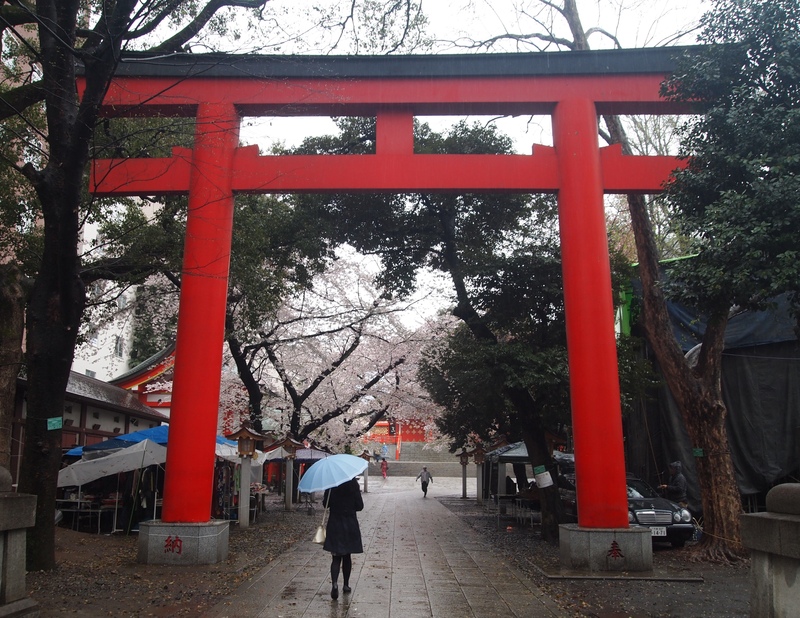 However, as soon as I get to the Hanazono-jinja Shrine, it starts to pour. I’m going to get drenched without an umbrella. I remember seeing another Family Mart near the shrine, so I backtrack and buy the 1,280 yen umbrella, which is much sturdier than my expensive Tokyu Hands one. 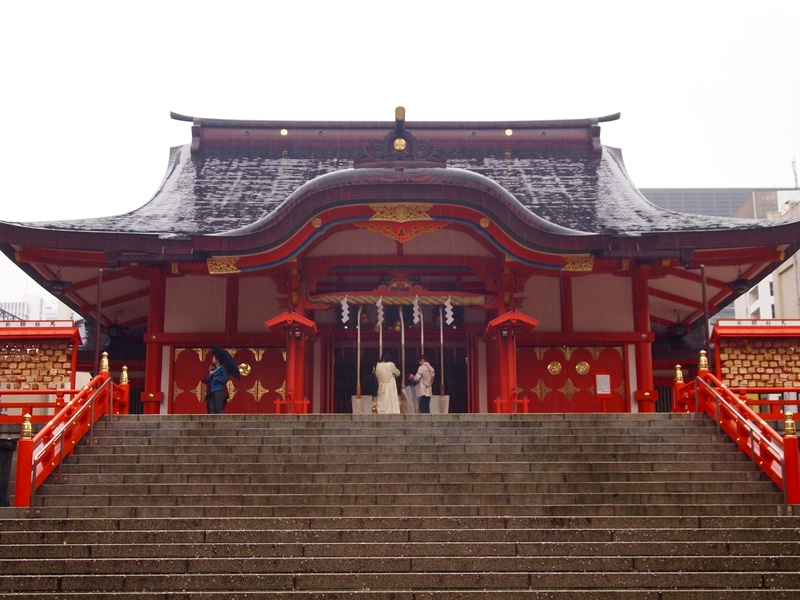 I walk back to the shrine, still brilliantly vermillion even in the rain. 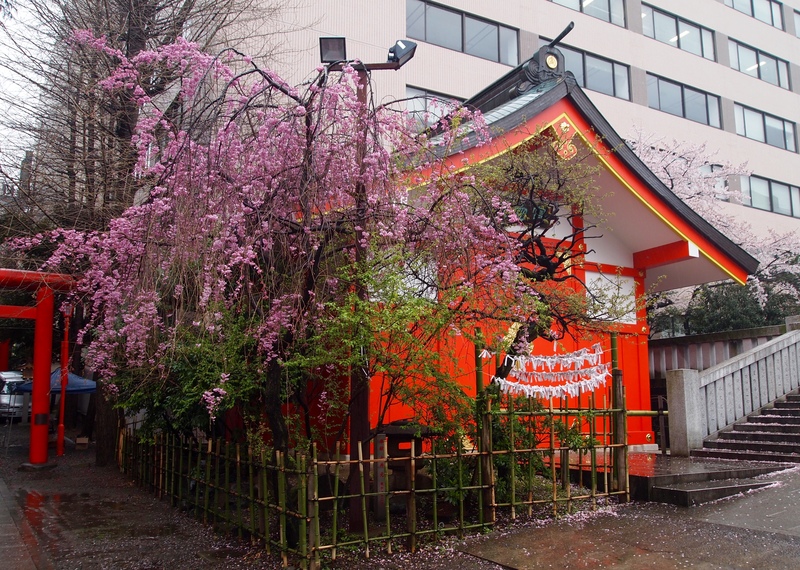 It houses the guardian deity of Shinjuku. 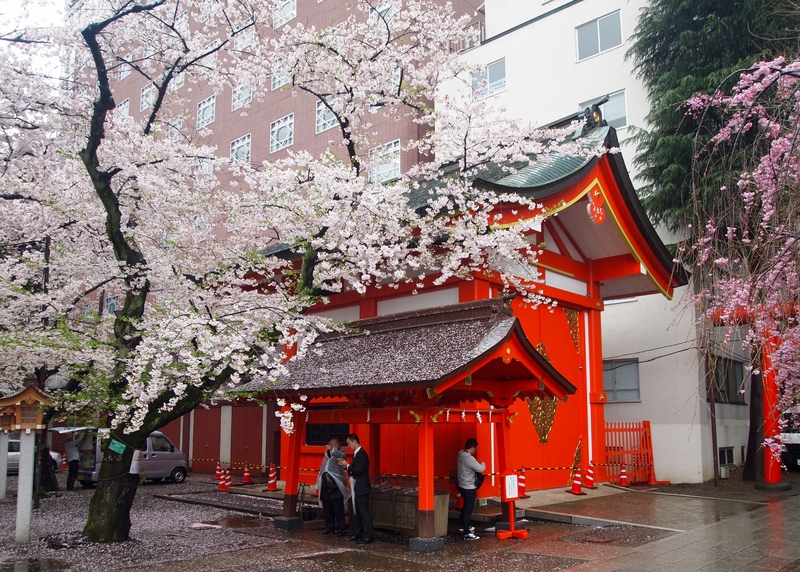 Hanazono-jinji Shrine dates back to before the founding of the city of Edo, the former name of Tokyo and seat of power for the Tokugawa shogunate,which ruled Japan from 1603 to 1868. 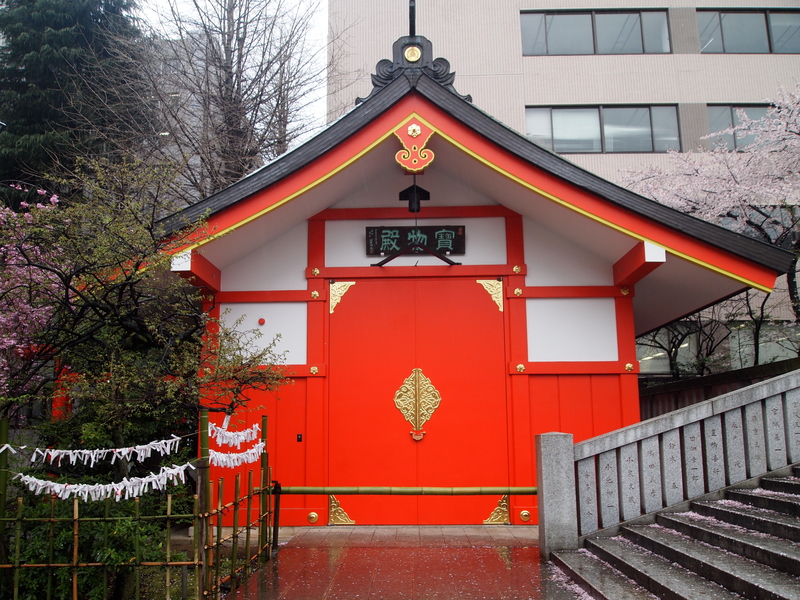 The shrine sits on the site of a garden that belonged to the Hanazono branch of the Tokugawa clan, which is why the name of this Inari Shrine is also that of a daimyō family; these were powerful Japanese feudal lords who, until their decline in the early Meiji period, ruled most of Japan from their vast, hereditary land holdings. 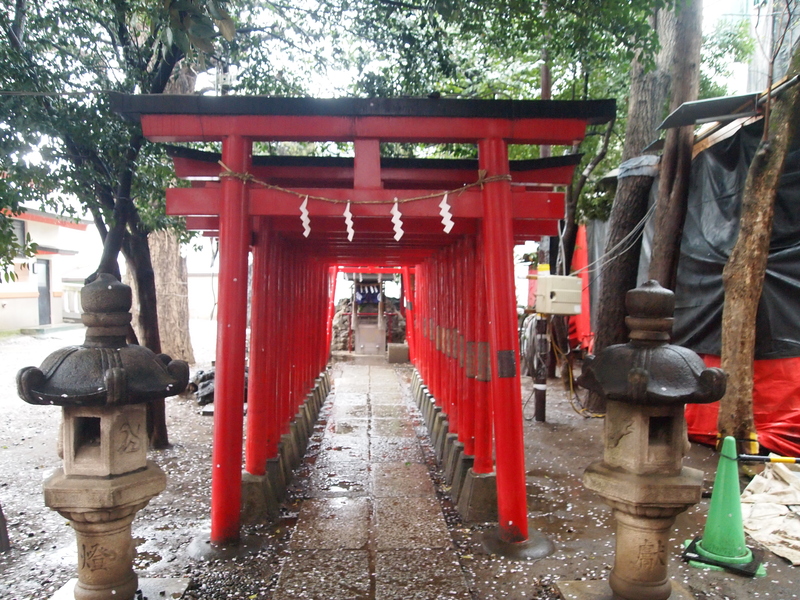 Inari is responsible for many things, one of which is the welfare of merchants. This leads many local shopkeepers to pray here for financial success. It’s feeling pretty desolate here at Hanazono, as even the vendors from the Sunday flea market are almost packed up. 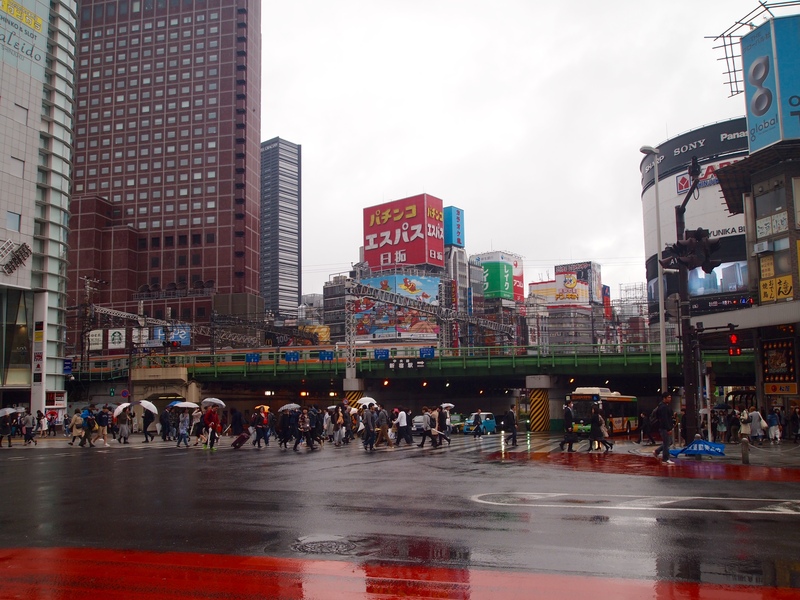 It’s 3:00 p.m. now, and I am tired of the day and of the rain, so I head back to Shinjuku Station to make my way home. 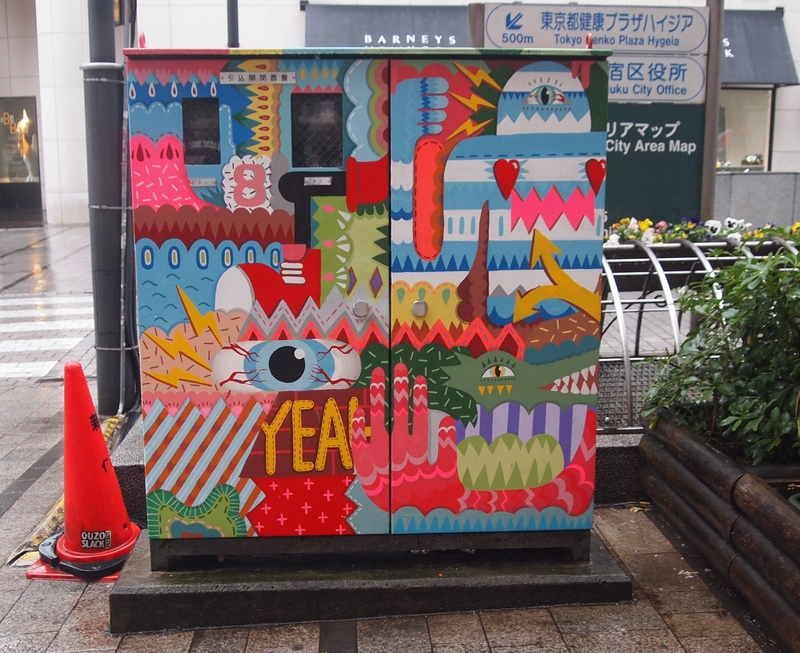 Before I descend, I see this colorfully painted metal utility box. It makes me smile before I weave through the crowds at Shinjuku to get back on the train. 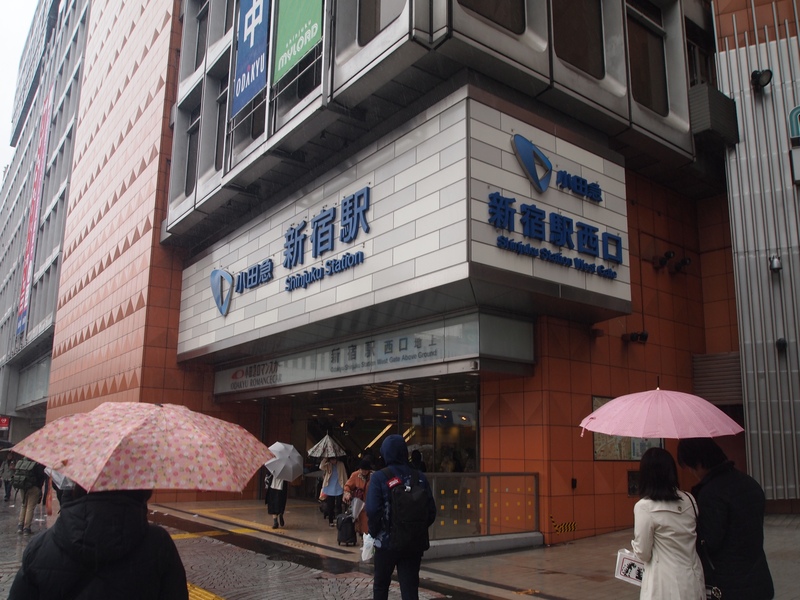 This time, I take the Rapid Express Odakyu line for Machida, and then to Fuchinobe, where I ride my bicycle home in the rain. Upon returning home, I enjoy a glass of wine and actually cook myself a meal of salmon with some prepared asparagus and a vegetable rice patty. I’ve been watching the newest season of Grace & Frankie; soon after I settle in to watch, I drift off to sleep, exhausted from the day.